Karen Anders, age 79, of Hobart, passed away Friday, March 15, 2019 at Life Care Center of the Willows in Valparaiso. She was born in Gary, Indiana on May 24, 1939 to the late Harold and Evelyn (nee Mummery) Anderson. Karen volunteered at the Willows Nursing Home in Valparaiso. She enjoyed crocheting, loved animals, but most of all adored spending time with her family. Karen is survived by her daughter, Debby (Robert) Evans; son, Joseph (Lourdes) Anders; grandchildren, Justin Evans, Lindsay Jones, Gary Cruz, Ela Cruz; brothers, Randy Anderson, Dennis (Lucille) Anderson; and many nieces and nephews. She was preceded in death by her husband, Joseph E. Anders; and her parents. A funeral service will take place Wednesday, March 20, 2019 at 10:00 am with Pastor Tom Potter officiating at Rees Funeral Home, 600 W. Old Ridge Rd. Hobart, IN 46342. She will be laid to rest at Graceland Cemetery, Valparaiso. Visitation will be held Tuesday, March 19, 2019 from 2-8 pm at Rees Funeral Home, Hobart Chapel. For more information, please call 219-942-2109. Online condolences may be shared with the family at www.reesfuneralhomes.com. This information was obtained from: https://www.reesfuneralhomes.com/obituary/karen-anders. 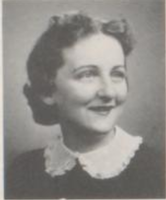 The picture was obtained from the 1957 HHS Memories yearbook, made available by the Lake County Public Library, at: https://archive.org/details/HOHS1957Images/.